It has been quite an exciting last few weeks for us Tau players. I've already checked out the rules for these two. 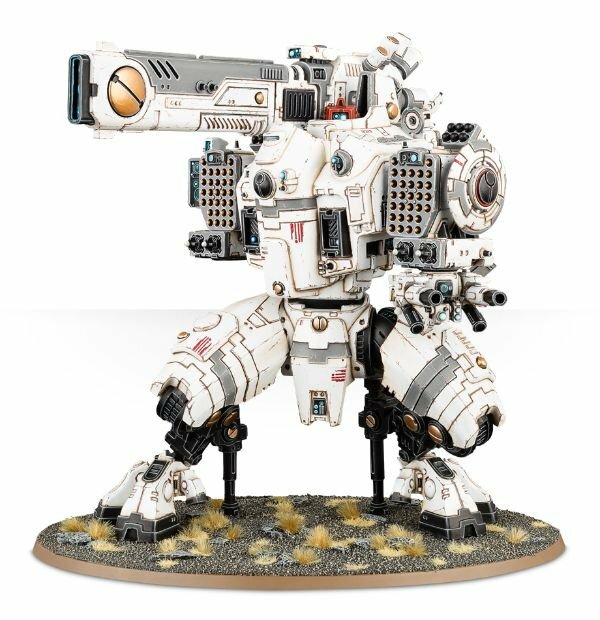 There is the Forgeworld model: KX-139 Ta'unar and then there is a the KX-128 Stormsurge. The two are quite different, with the Ta'unar being almost half-again more expensive than the GW codex LoW. While the Ta'unar is an insanely tough nut to crack, the Stormsurge is probably the most fragile Gargantuan Creature in the game. The Ta'unar also vastly outlclasses the Stormsurge in terms of firepower against most targets, especially if the Stormsurge is forced to move around. It isn't very expensive, since it comes with the drones for free, but it doesn't hit very hard either. It could be a replacement for Deathrain crisis teams, and they are likely only going to get better when the codex drops and we see what the new rule Fireteam does. There is also the special Optimized Stealth Cadre, that is going to be a formation in the codex that could make them even better. At this point, they are decent but might become an auto-include if the special rules and/or formations end up tipping the scales. That is quite an interesting change. It makes troop taxes for formations a bit easier to swallow. The first thing that pops out is the weapon: Pulse Blaster. Short ranged (even shorter than the current Pulse Carbine) with scaling strengths depending on the distance to target, just like the Stormsurge's Pulse Blast Cannon. Above 10" it is quite a weak weapon, essentially the equivalent of an Astartes shotgun. Between 5-10" it acts like the pulse weapons we have come to know and love, but below 5" is where the craziness starts. If you can somehow, someway, get your Breachers within 5" of their target, their weapons will be S6 AP3! The second notable piece of new kit is the DS8 Tactical Drone Turret. Which is essentially an un-targetable SMS or Missile Pod that only works if the Breachers don't move. This gives us our 'squad heavy weapon' that cannot be sniped out of the unit, at the cost of mobility. Given the Breacher rules, this turret looks much more suited to the traditional Fire Warrior Striker team, so we are all hoping that it is in their profile. It isn't the Rail Rifle or Ion Rifle that we were hoping for, but at least it is something. This comes with the traditional Commander rules and a new model. It shows us that the Commander's statline remains unchanged (though the point cost is unknown). The entry also makes no mention of Signature Systems, which is an odd exclusion. However, it could mean something as simple as lumping all systems into "Support Systems" and making some of them "one-per-army" to reflect their special nature. This would end up as a bit of a nerf, since you wouldn't be able to stack tons of systems on a commander without hurting his other areas (defense/offense/support). It could also just be shoddy rules representation for the White Dwarf that doesn't actually match the entry in the codex very well. We shall see. The XV-86 Coldstar suit is quite interesting. Fluffwise, the XV-86 was used for operating in Deep Space. That is reflected in the game by giving it the ability to fly. The upgrade is 60 points. This seems expensive but it automatically includes a missile pod, High Output Burst Cannon, multi-tracker, blacksun filter, and 2 slots for support systems. The HOBC is a regular burst cannon with 2 extra shots and Twin-Linked. It could be a safe assumption that the weapons are worth at least 15 points each. So, essentially, for 30 points the Coldstar commander can become a Flying Monstrous Creature without Smash, Fear, or Vector Strike. So it can glide or swoop, Hammer of Wrath, Jink, choose Skyfire or not, and go into ongoing reserves. Considering the Velocity Tracker alone was 20 points in the last codex, this isn't very expensive. The only real downside is that you don't get to pick your weapons, which could be a big deal when the only two weapons you get are mismatched like a burst cannon and a missile pod. That and you'll have trouble joining units, since you run into the issue of Independent Characters being unable to join units that have a MC in them. Though it appears to be sold out, this might become an item you can buy in pieces. Looking at the rules, it seems fairly decent, but I am not as familiar with using fortifications, so my opinion won't count for much here. So you essentially have a defense line that can move 6", but only over open terrain, which is Really rare these days. The Railgun is 'ok' but might be better if it gets a bump to D strength in the codex. With the special rules it almost ends up being the equivalent of Longstrike in a Railhead but without the vehicle. I doubt Railguns will become strength D though, since a D strength weapon would not need Tank Hunter or Monster Hunter. That is quite unsettling, considering how badly Tau need a long range anti-tank solution. The drone addition seems a bit lame to me, since 4 drones won't be much help in screening this fortification. It costs 60 points to add the drone center which isn't all that amazing when you consider how cheap piranhas are, but you can at least have access to marker drones instead of gun drones. The defense line could be pretty awesome if you can stack Everything behind it. You are bound to make some saves, and on a 6 it will auto-wound whatever shot you and at the same AP. Based on how you handle cover vs. armour saves, the direction of shooting required, and models needing to be On the rampart to use it, I don't see this being too much of a problem for enemy forces. Still, those bodies add up, just like Overwatch, Dangerous Terrain, and Interceptor. Tau have found yet another way to chip away at the enemy in his own turn. Given that 40k power creep has progressed into the realm of 'almost-apocalypse' I can't see this being overly useful. 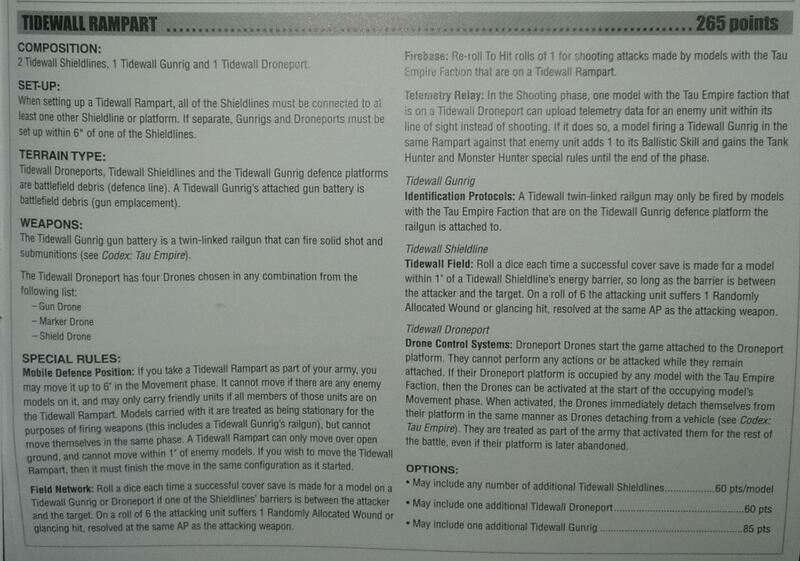 The Rampart has to stay in the same configuration and move over open terrain, which is extremely limiting. On a board that is probably already packed with cheaper, faster enemy units, there really isn't anywhere to go except straight back anyways. He is 75 points, but if you take out the Honor Blade and Homing Beacon, he is 50 just like in the current Codex. This is not unheard of. The other campaign supplements and the FSE supplement all used regular characters with specific wargear then added a name to them. It has a Fusion Blaster and is 55 points. So that is 5 points more than you would normally pay for a Fusion Piranha. This team is specific, and their veteran character actually appears to have special rules: Unyelding and Ignores Violations. That could mean Stubborn and Moves Through Cover but I am not sure. It could also mean Relentless and Feel No Pain. When you take them altogether, everyone gets Scout. Those that already had Scout gain Infiltrate. Based on some other images going around, we see that Devilfishes will still be 80 points. Pathfinders are still the same. Iridium Armour will still be available (pictured with the Crisis Suits) and is similar to the Broadside look, so it is likely that Broadsides will still have their 2+ save. So far, my prediction that our 6th edition codex was merely a precursor to the 7th edition codex is holding true. Very very little has changed so far. What I have been very wrong about so far, is that the new kits will match very powerful units. The Stormsurge, Breachers, and Coldstar have been a bit lame. 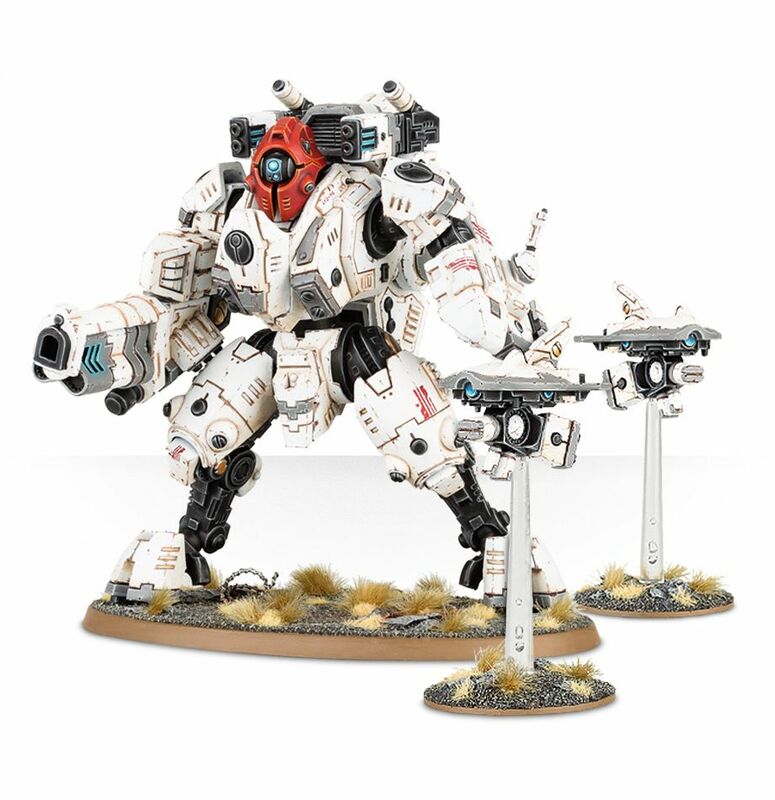 The Ghostkeel looks to be a pretty neat addition, but only as a replacement for units we already have, not as an answer to Imperial Knights and other Lord of War. Edit: It appears that if you buy the Warzone Damocles Kauyon book, you can actually use it alongside your 6th edition codex and skip the 7th edition codex altogether. So it turns out I was correct after all. Hurray for being right! Oh wait, our codex isn't getting a buff...Noooooo! Ugh, stealth suits are still 30 ppm, vespid still aren't worth it. Kroot are still frail, HRR still has no reason to be used. Yeah, the breachers seem like an alright choice for cover rich boards. nothing in the rules about those pistols we keep seeing in the pics though, interesting to see if GW thought of this either. As the new turret isnt a valid target I'll use my broadside missile drones or riptide shielded missile drones to represent the turret. Either that Or I'll scratch build them using spare missile pods. All and all, it would seem that figure wise we are getting quite a few nice looking models. I have to say though the breachers are quite disappointing. However, I think there might be still hope for them. Has anyone seen or heard of any rules regarding their armor? It's quite different then Strikers so maybe they get a better armor save? That is the only way I see them working. Since you can't mix the two (not that I'm aware of), it would be quite nice if the breacher armor gave a 3+ armor save instead of the normal 4+. If you then add the 5+ drone. You might be more eager to field them and send them on assaults.